I'd like to paint a picture, let the day wash all over you and make you feel like you were there with us! Give you a taste of what we do! We picked our guests up one chilly misty November morning as the bells of Spello rang out 10am. It was a nice coincidence that all our guests were in Spello, so no other pick-ups were needed! So we had Lyn, Bruce, Bill, Justice, Allan, Mike and Anna along for the day. Bill came well prepared with several 'dame' (5 lt glass jars) just in case we hit a cantina that did 'sfuso' wine - this is a wonderful way of buying your wine - you take your dama to the cantina and ask for vino sfuso, the guys at the cantina take you to the big steel vats and get what looks for all the world like a petrol pump and loads up the dama with 5 litres of the gorgeous grape stuff! But I digress! The dame fitted in snuggly behind all the seats along with a coolbox full of cold water bottles and little snacks. And we were off! 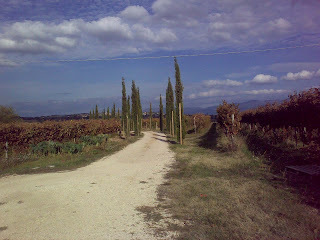 First we went right out into the Umbrian countryside, down an unmarked unmade road to our first cantina. We'd already explained that the cantina itself was a work in progress, but the wines were lovely, so although it wasn't the prettiest place, they'd get a real feel for a local authentic cantina - bit rough and ready, but what a great position with views through the vines over the countryside looking towards Montefalco- as my Nana would've said "It'll be lovely when it's finished" He'd laid on bruschette with his own new olive oil - olio nuovo - drizzled on top - spicy and 'green' tasting! He said that the oil was less than a day old - it was THAT fresh! We were in the barrel room underground for the wine tasting, surrounded by the oak barriques and the stainless steel vats, mountains of bottles and case upon case of wine.... Heaven! We had a barrel tasting of an experiment of his - a creamy oaky chardonnay. A successful experiment, we think, so hopefully next year (this year now!) he'll do it again! We tried his Montefalco Rosso DOC and the stunning Montefalco Sagrantino DOCG we also had a taste of his sagrantino passito - the dessert wine of the area. We then went back out and up to what will be the cantina one day - we picked our way carefully to the house and found inside a room full of racks with the sagrantino grapes air-drying. They'd been there for about 3 weeks and they'd remain there until just before Christmas by which time they would have lost about 70% of their juice. The concentrated remainder is what is used to make the Passito. If you've never tasted it, the closest I can think of is a rich Port. After Mark had loaded up our guests' purchases and plenty of photos had been taken, we took off for the next cantina. We drove up into the hills near Montefalco winding through the country lanes, up another unmade road and to our second stop for the day. By this time we were much higher up and the cantina had the most wonderful views over the Spoleto Valley looking down at Assisi, Spello, Trevi and in the distance the main town of Perugia. The mist hadn't disappeared from the valley but we were above it here in the hills and the view was spectacular; the huge Basilica on the plain in Santa Maria degli Angeli had it's impressive dome peeking out the top of the mist - that was all you could see on the plain, the whole valley looked like a cauldron of dry ice swirling across the plain! Meanwhile - Ha! We were in glorious sunshine! We were greeted by the entire family plus the dog and cat at this cantina, everyone shook hands and introduced themselves and the family guided us into their small tasting room,there wasn't enough room for us all plus the family, so the father and daughter (and the pets - most of the time!) stayed by the door peering in! The family had put plates of stuzzichini (snacks) on the table, their own salami was the star of the food show! Delicious! As we tried their wines, they guided us through what snacks went best with which wine - and they were right!! We tried their Grappa too. Not my personal taste, but the others thought it was lovely! 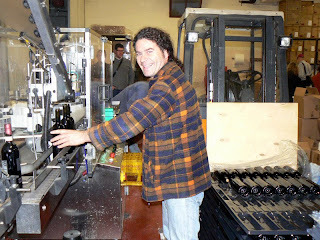 After the tasting, they showed us around the cantina, the barrel room and the bottling room with the animals following us, hoping for some attention! We were feeling a little peckish by this time, so we made our way to a nearby, beautiful Agriturismo - a lovely place tucked under the town of Montefalco with the buildings made from the local stone and a traditional interior in the restaurant. We were treated royally with plates of their own cured meats and pecorino cheese with local honey, bruschette with their own Olio Nuovo - delicious! Jugs of their own wine were dotted around the table along with bottles of natural and fizzy water. The pasta (hand-made obviously!) course was sublime with wild mushrooms and truffles followed by a juicy fillet beef steak with fresh local vegetables, then, for many, the piece di resistance - a hot chocolate souffled sponge dessert - indescribably good!! Even though we were fit to burst, somehow we all found room for this masterpiece!! Anna is a vegetarian, and the Agriturismo catered for her beautifully. It was gone 3pm before we thought about moving onto the next cantina! This one was up a long drive going through their olive groves on one side and some of their vineyards on the other. Again, it looked like the whole family were there to greet us! The wife had made some delicious little goodies to go with the wine-tasting and the weather was so good that we sat out on their covered terrace looking out over the spectacular view of the valley - the mist had almost disappeared by this time and you could see the little villages of the plain dotted around. We didn't try their Sagrantino unfortunately because it's still maturing in the bottles and won't be ready before June 2010, the other wines were delicious though. Again we were talked through the wines with the food - again, it was amazing that we found the space for more food, but it was so tasty that we couldn't resist! Homemade torta di pasqua - a kind of cheesy bread. 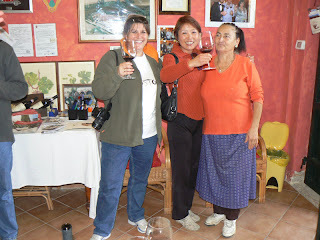 We were told about the cantina and how they were organic with both their wines and their olive oil. They explained that they have introduced nesting boxes to encourage birds to come and make their homes there and eat the insects plus there are bigger nesting boxes which have attracted hawks, these help keep the bird population down! They also have a webcam in one of the hawk boxes and the very day they set it up a 'family' moved in and laid eggs! It must've been fascinating and exciting to be able to watch these beautiful birds care for their eggs and then watch while the eggs hatched! All without having any contact with the birds. The wine makers wife had made little apple cakes made with wild apples to go with their own Grappa to finish off the tasting - even I liked it! The cakes complimented the Grappa perfectly! After loading up the latest purchases it was time to head for the last cantina - this was an experiment - we wanted to see if we could 'do' four cantine in one day. After this test, we have decided that three is enough!! 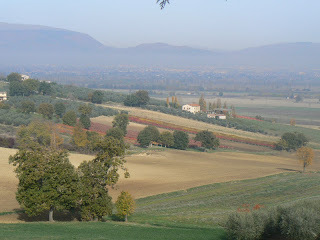 We drove once again through the gorgeous countryside of the Massa Martina hills past the autumn colours of the vineyards and admired the fabulous panorama - it had turned into a beautiful day! We descended into the cellars after gazing at the view across the hills towards Assisi and toured the vat rooms and the barrel rooms with one of the family owners, it was pretty noisy there, the bottling machine was going full pelt, there were locals wandering around shouting over the noise of the machine to each other (getting their weeks supply of wine in huge 25 and 50 litre glass jars!) - we weren't very quiet by this stage either! 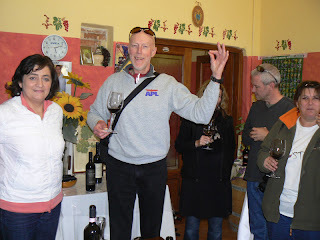 Bill had found his cantina to fill his 'dame' with vino sfuso and then we tried some of the many wines on offer at this lovely local cantina. Then I saw that the winemakers Mum had what I thought was a 5 litre jar of water and she was pouring in liberally into everyones glasses - I nearly joined in, I could've done with some 'acqua' - only to realise at the last moment that she was being very generous with some homemade Grappa!! Time to round everyone up and take them home!! A good time was had by all! A really great fun day out, as usual!